Chop Chop. Portuguese cooking has spread all over the world. Take a chopper and a chicken and you are already half way to a culinary masterpiece, audacious in its simplicity, that will have your guests demanding the secret. Donâ€™t tell â€˜em! 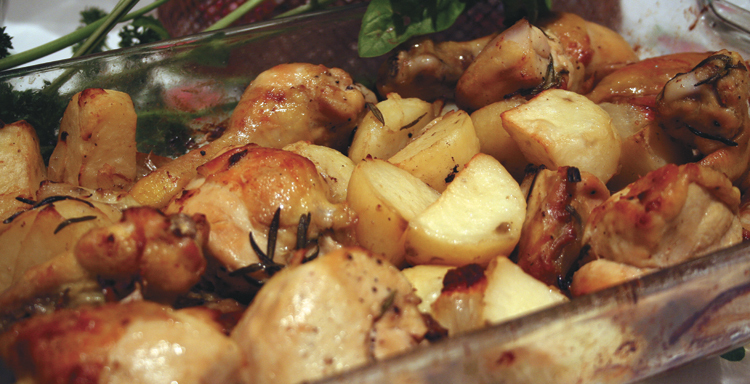 This astonishing dish couldnâ€™t be simpler, but the interplay of chicken, garlic, rosemary & potato has complexity beyond belief. The Portuguese aren’t known for their cuisine – the world’s cities aren’t crammed with Portuguese restaurants in the way that Italian, Chinese, even Japanese restaurants crowd every town. Even German food can be found all over the world in the forms of the Americanized Hamburger and Frankfurter. It is all the more odd then that Portuguese cooking has had the influence that it has. Japanese Tempura? Nothing but deep-fried prawns in batter, and absolutely nothing like any other Japanese cuisine. You’ve guessed it – Portuguese explorers took the idea with them, and the Japanese made it their own. The British Fish and Chips is pure Portuguese, and miscalling the chips “french fries” fools no-one born east of Cape Cod. The French think the chips are Belgian, as do the Belgians (it was the Flemings who brought the dish to Britain), but southern Europe knows they are Iberian. Who had both Olive Oil and New World potatoes first? Not the Belgians. And as for Cod, the far-ranging Portuguese were catching the cod off Newfoundland in open boats before Columbus was even an idle thought in his father’s head. This cod, salted and dried, is called Bacalao, and has a flavour and succulence all its own when brought to life in any of a hundred different dishes. The Japanese word for bread, “Pan”, is an import from Portugal too. The southern Chinese also owe several classic Chinese techniques to the influence of these great travellers. The use of batter to coat meat can be traced to the Portuguese, and there are other indications of cultural cross-over. These are less obvious than in Japan, whose native cuisine is so starkly simple that anything foreign stands out. Macao is the place to go for perfect Chinese and Portuguese fusion cooking. The Portuguese not only brought oil and oil-cooking, they brought spices from India and Africa and cooking ideas from both, and sugar and pepper from the Indies. They brought chillies, peppers, tomatoes and potatoes from the Americas. A cavalcade of flavours and exotic foods, instantly taken-up and further developed by the sophisticated and curious Chinese. I’ve had better African Chicken in Macao than in Portuguese East Africa. Back home in Portugal, the take-up of such exotica was not so fast nor so comprehensive. The missing ingredient is the Chinese cook – the country people in Portugal being more conservative than their sea-faring cousins. Portuguese cooking from Portugal is dead plain, true, but it is still the basis of this influential and unsung cuisine. Good plain cooking is sometimes hard to do, relying as it must on the ingredients to make flavour without the help of spices and special techniques. And here is a recipe that packs an incredibly-flavoursome punch, takes less than five minutes to prepare, uses one kitchen implement only, (and you could manage with a penknife), and cooks in 60 minutes. Serves: You’ll need four or five friends, depending on the size of the chicken. Ask one friend to bring a lettuce and tomato salad. Ask the other friends to bring strong red wine – no namby-pamby chardonnays. Chop up the chicken and the potatoes into chunks. Not too small, say two to three inches. Skin neither chicken nor spuds unless the spuds are really old or dirty. Whack the garlic bulb on a hard surface and get the cloves. No need to peel. Spread the lot into a shallow baking dish, scatter rosemary and some salt and pepper on top, and give it a couple or five good glugs of oil. Don’t be mean with the oil, make sure everything is coated. Put into a hot 220oC oven for 20 minutes. Then reduce oven to 190oC, turn everything over to brown the other side and re-coat with oil and bake for a further 40 minutes.